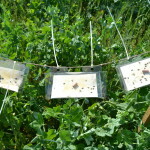 In summer of 2012 a research of jumping bean moth pheromone traps was carried out in co-operation with Plant Breeding Institute of Jõgeva. Tests took place on two different green pea fields. 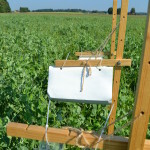 Traps were laced on first field on 18th of June and on second field on 20th of June when the green pea has started to blossom. variant: spraying with insecticide. Decis Mega´ga 0,15 l/ha was used for spraying. variant: comparative test of pheromone traps, where plastic trap was Atrakon AP, cardboard trap was Atrakon A and large cardboard trap was Atrakon AA. Traps were checked in the morning and butterflies of jumping bean moth were counted on the glue sheet. Sticky gue sheet and a dispenser were changes every week to make traps more attractive for the pests. variant: dispenser attractiveness test, where plastic trap Atrakon AP was used and where a new trap was added to the trap in order to see if the dispenser emits suitable smell for the jumping bean moth after several weeks of use. Traps were checked in the morning and butterflies of jumping bean moth were counted on the glue sheet..
First jumping bean moth butterfly was found on the morning of 19th of July in Atrakon AP trap. On following days the number of jumping bean moths increased and after 9th of July on some single pests were found from the traps. Second field started to blossom later and therefor the traps were placed there 2 days later in order to prevent random jumping bean moths to fly on the traps. Summer was unsuitable for jumping bean moths due to high temperatures and therefor the flying activity was lower than expected. During the whole monitoring period most of pests were collected from Atrakon AA trap and least of pests were in the Atrakon A trap, relevantly 66 on first field and 61 on second field and in Atrakon A trap 34 on first field and 49 on second field. Dispenser impact decrease was not noticed. Damage of jumping bean moth was determined on 21st of July by collecting 100 green pea pods from test fields and identifying the damage of jumping bean moth. Most damaged were peas on the test plot, where peas were damaged with jumping bean moth accordingly 38% and 48 %. On test plots with pheromone traps the damages were 22% and 30 %. Least damages were on the test plot, which was sprayed, relevantly 10% and 11 %. 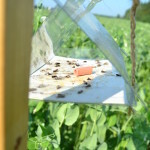 We recommend to use pheromone traps for determine of right flying time. When the trap collects 5-10 jumping bean moths during twenty-four-hours, it is the sign of rather heavy flying period and need for spraying. Best time for spraying is when as much as possible of moths have hatched from eggs and are not yet entering the pod. Right spraying time can essentially decrease costs on plant control means..
Traps were placed in 5 different small gardens in order to identify how much jumping bean moths can be found in home gardens. Two traps were in Tartu County in Verevi village in Rannu perish and Uhti village in Ülenurme perish. Two traps were in Põlva County: Tilsi village in Ladeda perish and in Pindi village in Räpina perish. One trap was in Jõgeva. Most of jumping bean moth was found in Põlva County tests. 26 and 20 moths accordingly. Green peas were grown on these lands previous years and therefore it is possible to assume that the jumping bean moth has survived the winter, gone through a development cycle and came out during blossoming of the peas and had very good conditions. We strongly recommend pheromone traps in small gardens where people try to avoid pests control substances. Pheromones are harmless for people and they have impact only on pests, which are attracted into the traps with a smell and female moths will not mate. The number of damaged pea pods. Read more about pheromone trap of jumping bean moth HERE.